Get the deck of your dreams today with Sunburst Construction! Call for Details Not valid with any other offer. Coupon void if altered. Expires 05/05/2019. When your home is ready for a remodel – let the professionals at Sunburst Construction handle it! We only employ the best contractors to ensure your next custom gazebo or deck will be the life of the party. Located in Northern Virginia, we specialize in helping folks add flair to their backyard with the finest materials available. Whether it’s a new stone walkway, pergola, arbor project or other outside accoutrement – we’ve got the skill and wherewithal to see your project through to completion! Before you call to make an appointment, be sure to get one of our printable coupons for the best savings on your next project. 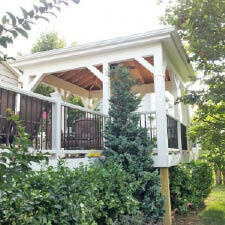 Get more enjoyment out of your backyard with a beautiful gazebo built by Sunburst Construction. From a quiet place for yourself, to a place for children to play, there are many ways to utilize a gazebo in your yard. We'll help you design the perfect outdoor gazebo for your existing space and our licensed contractors will make it a reality. Complete Decks, Deck Replacement, Outdoor Living Spaces, Patios, Pergolas, Masonry, Porches, Porticos, Fireplaces, Fire Pits. Sunburst Construction, located in Ashburn VA, is the best construction company in northern Virginia for an outdoor gazebo, pergola or patio. We cater to clients in the north Virginia area including Brambleton, Southbridge, Sterling, Reston, and Potomac.